It’s quite tempting to buy ready-made Christmas decors we see at department stores and at the malls. The problem is, they can be expensive especially the new stocks with new designs. The good news is you can create your own with the help of your kids if you want. Apart from using art and recycled papers, you can also use ingredients found in your kitchen. Here are some ideas on what you can do and what you can use to create fun decors for your tree, door and dining table. Popcorn – Cook your popcorn first and then string them together using a needle and string to create garlands. Use the plain popcorn only. Once done, you can put them on your Christmas tree. Candy canes – Obviously, you can hang them on your tree or you can put some on your wreath. Citrus fruits – Citrus fruits emit a sweet scent in the home. What you can do then is cut slices of lemons, limes and oranges and dry them first before hanging them on the tree using ribbons or colored string. To dry the citrus fruits, bake them in the oven for about two to three hours. 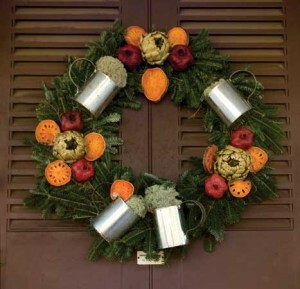 Herbs – To create a wreath, gather bunches of different herbs (oregano, thyme, sage or rosemary). Whatever is available will do. You will need a styrofoam in round shape that will serve as your base. Then cover the styrofoam with the herbs using a glue gun. You can mix them or group them by type. Finish by putting a ribbon at the top part. Vegetables – The veggies when put together in a creative way in a bowl or small platter can make a great centerpiece on your dining table. Use pearl onions, asparagus, radish, baby artichokes, cauliflower and broccoflower florets. There’s no need to spend much for your Christmas decors. Go green and save! Happy decorating!